Ask fellow campers about "The Springs at Borrego RV Resort and Golf Course" and nearby attractions. We stayed in a large, level, pull through site. 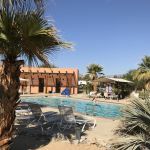 This is a young, well laid out and clean, quiet resort that we are already planning our next trip to The Springs is a quiet, comfortable, place to use as a base to explore both the Anza Borrego desert, and the funky little town of Borrego Springs. We camped at The Springs at Borrego RV Resort and Golf Course in a Motorhome. Take some time to visit the town of Borrego Springs it is a funky little artist type place. Great Mexican food at Margaritas and superb eggs Benedict at Kendall's cafe. Very nice park with a beautiful golf course. Stayed 5 nights. We don’t play golf so did not get to use this amenity. The grounds are beautifully maintained. Very helpful staff. Beautiful views of the mountains. Will return in the future We camped at The Springs at Borrego RV Resort and Golf Course in a Motorhome. If you are staying less than a week bring what ever groceries you need. Very limited groceries. A great store to visit is Borrego Springs Outfitters. Recommend the Red Ocotillo for lunch. We had a group of 18 RVs getting together in Borrego Springs for a golf outing. The staff member was extremely helpful in coordinating our reservations. The check in process was very efficient. She provided packets for us, and when we arrived, she and an assistant were there to greet us and give us our packet. They escorted us to our sites and allowed us to pay our remaining balance after we set up. Sewer, water and cable all conveniently located. There are two sewer connections. The check in staff were very courteous, pleasant and efficient. We played their golf course which is a nine hole, very well maintained course. It is very reasonably priced. All our 28 players enjoyed it. The resort has very large sites and has a lot of amenities. They pick up garbage each morning at your site. They have a nice pool and hot tub and a number of large dog runs. The wifi worked well for us. Some of the sites had some difficulty connecting. They have some park models where one in our group stayed. Three bedroom with kitchen. Clean. They allowed us to use the meeting room for our group of 40 people and even provided us with a wine tasting. Great facility and well managed. We camped at The Springs at Borrego RV Resort and Golf Course in a Motorhome. On site golf course is a 9 hole nice course. Rams Hill golf course and restaurant is super nice. De Anza Country Club nearby and a beautiful course. Carlee's is a good restaurant to have dinner. The metal art sculptures are amazing. A short drive from the Springs RV Park. They provide a map of where the 130 monuments are. These are a good reason to come to Borrego in themselves. Very nice park. Rate is weekly, with electric charge added in. Much nicer than other places I have stayed at this rate. The sites are very wide and everything is impeccably maintained. Service is great. The golf course is only nine holes, but its in great shape, and a fun little course. The pool and spa area are beautiful. Large selection of cable channels included in rate. Verizon is good, wifi very sketchy, but in their defense, they tell you that right up front. Sites are built into a slight hill, so it looks like nearly every site requires some side-to-side leveling. My only real complaint was the place was overrun with dogs (probably because of the really great dog park), and rules about barking and leashes are not really enforced. We camped at The Springs at Borrego RV Resort and Golf Course in a Motorhome. It may sound expensive but they deliver. Hot mineral baths, one large and two smaller ones for couples. Nine whole regulation golf course in tip top shape. Pickle ball, tennis, swimming, yoga, star gazing, it goes on. Sites are not pushed up against each other and have mature landscaping. Our two labs loved the two dog parks and the wash station. We plan to go back every year. We camped at The Springs at Borrego RV Resort and Golf Course in a Travel Trailer. About as nice a RV Park you can find. Full hookups, pull through site across from golf course. Nice spacing between sites. Loved the small town of Borrego Springs. Only negative for us was spotty WiFi. 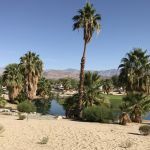 We camped at The Springs at Borrego RV Resort and Golf Course in a Travel Trailer. This park has changed ownership and no longer deserves the historical high ratings. There are a few planned activities and the new owners have added charges for activities that used to be gratis. For example, it now cost five dollars for each water aerobics session, yoga, pickle ball, etc. The plastic picnic tables, for the sites that have one, are badly deteriorated by the bright sunlight and are patched together with duct tape. The concrete surfaces around the swimming pool and hot tubs are badly eroded and unsightly. Four of the laundromat machines are out of service as well as some of the dryers. It's a shame to see a once great RV resort go downhill like this and I hope that the new owners come around to restoring the facility to first class. We camped at The Springs at Borrego RV Resort and Golf Course in a Fifth Wheel. Enjoy the desert ambiance and lack of hustle and bustle! 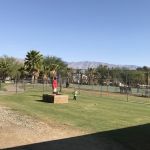 This is the nicest park that we have stayed in the desert Southwest absolutely perfect and the golf course in very good condition we will definitely be back again. We stayed in a premium pull through spot directly across from the pool area. The spot was raked with a dragon fly raked in the sand. The shower facilities were clean and nice. We camped at The Springs at Borrego RV Resort and Golf Course in a Motorhome. This is a nice Resort. Clean and well laid out and cared for. Lots of Snowbirds in the winter so its interesting to meet people from all over. We camped at The Springs at Borrego RV Resort and Golf Course in a Travel Trailer. Through the years we have stayed here numerous times. It is a short drive from San Diego where we reside. They have continued to improve and expand the resort. Borrego Springs is relatively isolated and not subject to the huge showbird crowds of the Coachella Valley. We had a great spot on the 2nd fairway of the golf course. The Fairway sites have both pull in and back in hookups. Very well done. We camped at The Springs at Borrego RV Resort and Golf Course in a Motorhome. We have been Snowbirds at this resort for the last 12 years. This year we were disappointed with our experience. As we drove in it looked uninviting and weedy - not the Desert Oasis we were used to seeing. The golf course had not been over seeded last Oct so it was in very poor condition. The golf course was our major reason for choosing this resort. They must have decreased the number of cleaning & maintenance employees because the grounds and sites were weedy and the meeting rooms weren't well cleaned. The bathrooms were not cleaned as frequently as previous years so often had wet floors. Many of the activities such as live music, wine tastings, and special occasion dinners we had enjoyed before had been discontinued. The remaining staff were as kind as courteous as previous years and did what they could to improve our experience. We camped at The Springs at Borrego RV Resort and Golf Course in a Motorhome. Stayed here over New Years with three other couples/rigs. All had a great time and we've made our reservation for New Years 2018 already. This was the second year in a row we stayed here over New Years. Excellent staff and service. We camped at The Springs at Borrego RV Resort and Golf Course in a Motorhome. Lovely park. Staff is extremely nice and helpful. Two separate dog parks, all with grass. Dog litter bags available all over the park. Didn't play golf, but the course looked a little worn. Very nice swimming pool and a good fitness center. Desert landscaping is really well done. Our site was level and spacious. It was cold so we didn't spend much time outside. Had we, I think the constant humming from the adjacent power substation would have been annoying. If I had to do over, I would have selected site 110. We camped at The Springs at Borrego RV Resort and Golf Course in a Motorhome. The drive up (west from the park) Montezuma Valley Road is beautiful. Also, the Anza Borrego SP Visitor Center is very nice. This our first time here as we camped here for Thanksgiving. The place is literally in the middle of nowhere! Sites & facilities were impeccable and very well kept. You can tell the management care about making the campground look good. They have a heated pool, 3 small mineral spas and 1 standard spa. Golf courses look amazing, kids loved fishing in the pond as there were plenty of bites. The only negative which is minor, they require a 4 night minimum stay for the holiday. We camped at The Springs at Borrego RV Resort and Golf Course in a Travel Trailer. Great place in the middle of nowhere! Facilities and staff were great and the area is very quiet. This area is considered a dark sky area which is an added bonus. The grounds were impeccably kept and the spots were large and comfortable. We would stay here again. We camped at The Springs at Borrego RV Resort and Golf Course in a Fifth Wheel. If you are staying less than a week bring what ever groceries you need. Very limited groceries. A great store to visit is Borrego Springs Outfitters. Recommend the Red Ocotillo for lunch. We had a great lunch at the Ram Hill Golf Course, it had been closed for 3 years and gone to seed, but has been bought and restored to beautiful condition and is now the top golf course in the area. Simply beautiful!!! The Outfitters is one of the best stores for top end "stuff" from wine to outdoor gear, a MUST visit when in Borrego. There are no supermarkets or chain fast food outlets in town. However, there are several restaurants and one small, well stocked market in town. The town of Julian is about an hours drive and makes a nice day trip. 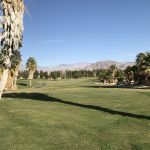 Are you affiliated with The Springs at Borrego RV Resort and Golf Course ?